A hot spot for hen parties and weekend breaks, Bath is the original city for spa lovers, with its historic roots steeped in the relaxing and healing hot spa mineral baths. Add glo's mobile spa treatments to your hen party plans and we will provide a salon experience in the comfort of your self catering accommodation or hotel. Our pamper treatments comprise the most popular beauty and massage options including Facials, Mani's, Pedi's and Swedish massage. And with our professional treatments starting at only £28.50 per person, our professional treatments are often more affordable than going out to a spa. We'll organise your pamper party around you and your other weekend plans! 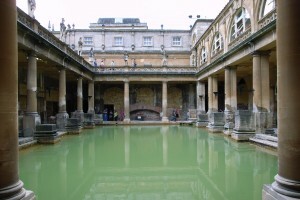 We love bath and here's the low down on what makes it special - past and present: In 863 BC Prince Bladud apparently founded the city of Bath around the hot springs in gratitude for it's healing properties when his leprosy was cured. Prince Bladud is thought to have been the father of King Lear. 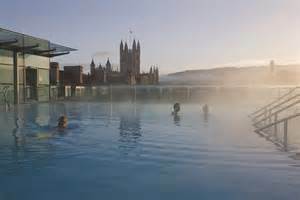 Three natural hot springs are found beneath the city - the King’s Spring which supplies the Roman Baths, and the Hetling and Cross Springs, which can be experienced at Thermae Bath Spa. A quick train ride from London, it's manageable size and beautiful architecture makes Bath a perfect destination for a weekend break or hen party. glo's mobile spa and pamper parties can be experienced in self catering accommodation, or hotels and are designed to fit around other hen party activities or weekend plans. Once you've enjoyed your glo pamper treats Bath's nightlife won't disappoint. With a great choice of well-known chains or independent bars and pubs you can enjoy a quiet drink or the ultimate party night out. Top spots for A-list style bars include Sub 13, Circo Bar & Lounge, Belushi’s and the Porter. If you’re in the mood to dance the night away, many places such as The Cork and the Porter feature live DJs, or make your way to one of Bath’s nightclubs such as Opa, Komedia, Second Bridge or Moles. If you're a fan of live music enjoy smooth jazz at the Green Park Brasserie, open mic at the pig and fiddle, Rock at the Komedia, or cabaret at The chapel arts centre. Or for something more traditionally cultural take in a show at the Theatre Royal or take a night time tour. Whatever you do, don't miss taking in some (or all!) of Bath’s many iconic sights: marvel at the magnificent Royal Crescent, The Circus, Pulteney Bridge and Bath Abbey and see all of those picture-perfect postcard attractions in Bath come to life. The city’s many museums and art galleries provide a rich and fascinating insight into fashion through the ages, 19th century astronomer William Herschel, Bath's industrial heritage, the life of Bath's most famous literary resident a the Jane Austen Centre and much, much more. Visiting during the summer months? Make the most of the warm weather and soak up the sunshine in one of Bath’s beautiful parks or gardens with a picnic or stroll around a crescent, deer park, skyline walk or botanical gardens, all with stunning views. If you’re visiting in the winter months don’t miss the annual Christmas Market, one of the most renowned attractions in Bath that sees the city centre transformed into a magical festive wonderland. The smell of spiced mulled wine and sound of carol singers is guaranteed to get anyone in the festive mood! The January Blues - Myth or Reality? 21st January 2019 is Blue Monday, but is the term Blue Monday or The January Blues a myth or reality. Glo Pamper share some insights into the term January blues with some useful tips on how to shake the January blues off. An introduction to glo's new partner! Amazing MonuSkin offer for glo therapists! glo is proud to announce a partnership with fantastic professional and natural beauty brand MonuSkin to bring amazing products at a special discounted rate for all glo therapists. © 2019 Glo Pamper Limited. All rights reserved.